Description The stage pictured here was set up for the dedication of Alumni Hall. 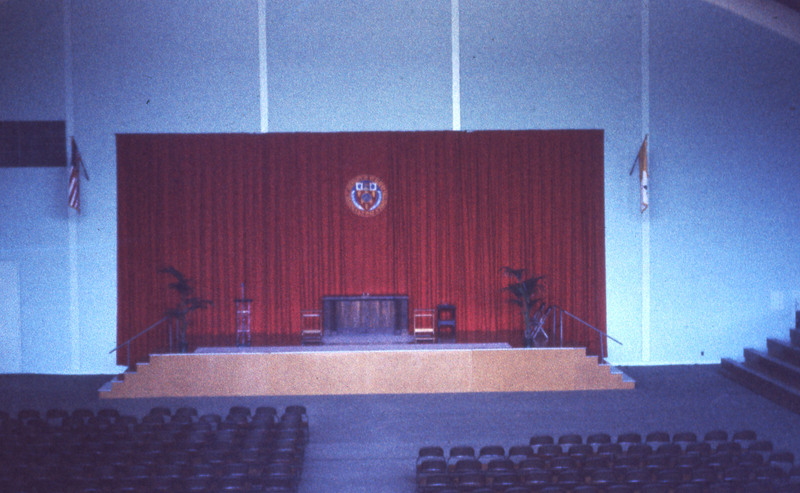 There is a view of the stage, curtain, and podium; chairs are set up on the floor and bleachers have been erected to the left and right. The flag on the left is the American Flag. Notes Alumni Hall is one of the earliest pre-stressed concrete structures of this kind ever attempted. Engineering magazines from the time noted that the eleven 160-foot pre-cast arches used in the building’s construction were a record-breaking span for pre-cast arch ribs used in the United States. Originally the gymnasium had a dividing wall separating it into two sections. On the floor of Alumni Hall is the Fairfield University seal. Renamed the Alumni Hall – Sports Arena in 1981, the gymnasium is the home of the women's Division I volleyball team and the Office of Sports Information. This is one of a series of 34 color slides depicting the construction of Alumni Hall from 1958-1959. The slides have been digitized in chronological order to show the progress of the construction over time, and have the identifiers SL002327 – SL002360 respectively. Original Format Slide; color; 2 x 2 in. Digital Specifications These images exist as archived TIFF images and one or more JPEG versions for general use. They were scanned at 2400 dpi, 24 bit from the original using an Epson Expression 10000XL scanner.